Manufactured with 6 mil. 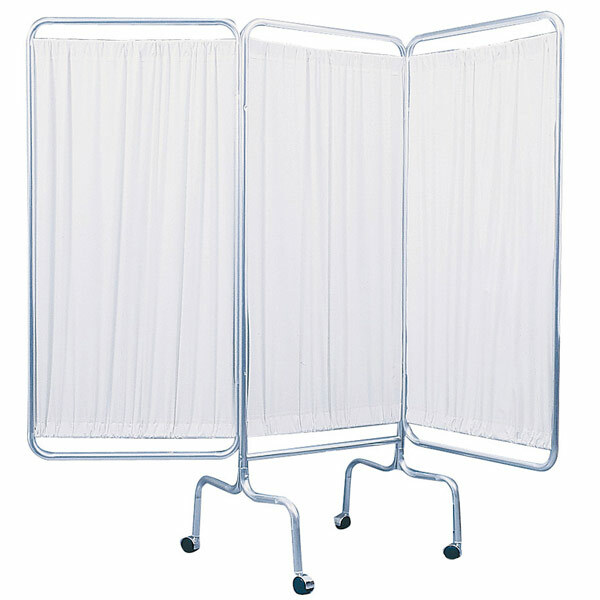 flame retardant bacteriostatic white vinyl and sturdy 1" anodized aluminum tubing, the 3-panel privacy screen from Drive Medical is well-built and functional. The materials are as easy to maintain as they are useful. Each hinged panel measures 56" (H) and 27 1/2" (W), giving the product an overall height of 70 1/2". Four 3" hooded casters make transportation and repositioning a cinch. The product weighs just 15 pounds (only 20 when shipped) and arrives protected by a limited lifetime warranty. Sturdy, 1" diameter anodized aluminum tubing. Screens are 6 mil. flame retardant bacteriostatic white vinyl. Four, 3" hooded casters. Easy to maintain and clean. Overall Height: 70 1/2". Product Weight: 15 lbs. Shipping Weight: 20 lbs. Each hinged panel measures: 56" (H), 27 1/2" (W)Limited Lifetime Warranty.